Sebastian Thomson was a chorister at Christ Church Cathedral, Oxford before moving to Harrow School with the top music scholarship. 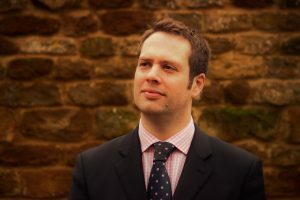 Sebastian studied at Bristol University before holding positions at Chichester Cathedral, St Matthew’s Church Northampton, Eton College and most recently, Bloxham School. Sebastian is gaining a reputation for commissioning new works. The Angels of Creation Commissions are a collection of organ works composed for and premiered by Sebastian. So far, David Bednall, Simon Whalley, Thomas Hewitt Jones, Neil Cox, John Hosking, Daniel Saleeb and Francis Pott have written for this project. His recent CD “Angels of Creation” received a 5 star review in Choir and Organ publication and awarded “Editor’s Choice” in Organists’ Review.